In the Customer Guidelines you find a selection of documents that we recommend that you as customer familiarize yourself with before starting your transportation. This should not be considered a complete set of documents that a shipper needs to review, but a selection of Höegh Autoliners' specific policies and guidelines. Customers transporting cargo destined for Oceania, with loading from 1 May 2019 to 31 August 2019, need to ensure they follow updated cargo requirements in relation to the Brown Marmorated Stink Bug threat in the region. When shipping crated or boxed cargo it is the responsibility of the customer to ensure that the cargo inside the crate is properly secured for sea transportation. There must also be appropriate lashing points available. This guideline shows the requirements shippers of crated and boxed cargo must adhere to when preparing their cargo for sea transportation. Customers are asked to provide cargo dimensions when placing a booking. The purpose of this document is to provide the necessary guidelines for our customers to measure all cargo the same way in all ports on a global scale. The Höegh Autoliners' Cargo Stowage and Security Declaration form must be filled out by shippers booking static or break bulk cargo weighing more than 10 tonnes on board our vessels. The Terms and Conditions of transportation with Höegh Autoliners are stipulated on the backside of our Bill of Lading. It is advisable to read the Terms and Conditions before starting the transportation. The Terms and Conditions of transportation with Höegh Autoliners are stipulated on the backside of our Bill of Lading. Due to specific rules in the United States of America there is a different set of Terms and Conditions for our US customers. It is advisable to read the Terms and Conditions before starting the transportation. To ensure all cargo transported is easily identified, please use the Höegh Autoliners Label Maker to create a label for Light Vehicles below 3.5 MT. To ensure all cargo transported is easily identified, please use the Höegh Autoliners Label Maker to create a label for High and Heavy/Breakbulk cargo. 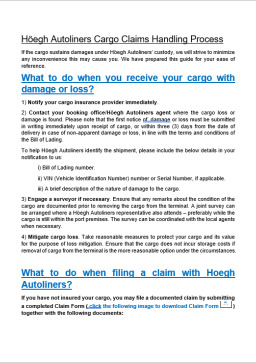 If the cargo receives damages while the goods are under Höegh Autoliners’ custody, we will strive to minimise any inconvenience this may cause you. We have prepared this guide for your ease of reference.